A place for Monkey Bike and Mini Bike (including Grom/MSX) enthusiasts. This will be moderated in accordance with C90Club rules. Welcome! Hi all, had my dax for about 9 months now and love it, it started out as a 50, then to a 70 using a crf70 chinese top end but with a 6v reproduction c70 piston with some filed off the top to give me the right deck height but work with the 12v style head, she's been geared up a bit and now using a Chinese 20mm carb and a kitaco inlet manifold. It goes alright but I'm after a bit more speed, mainly as I'd like a higher cruise speed. Anyway to cut a long story short I've just acquired a 4 speed semi auto 90 engine(non honda), my issue is and always has been that I want to use the original air filter but can't due to having to change from the standard manifold due to it being heavily restricted..
Is there any manifold available that would allow me to use the 20mm carb with the standard airbox as I can't seem to find one and it's annoying the hell out of me.. There's a ss50 manifold on eBay that looks promising but I'm not going to commit to buying any more bits until I'm certain it will fit lol. Hi Tom. 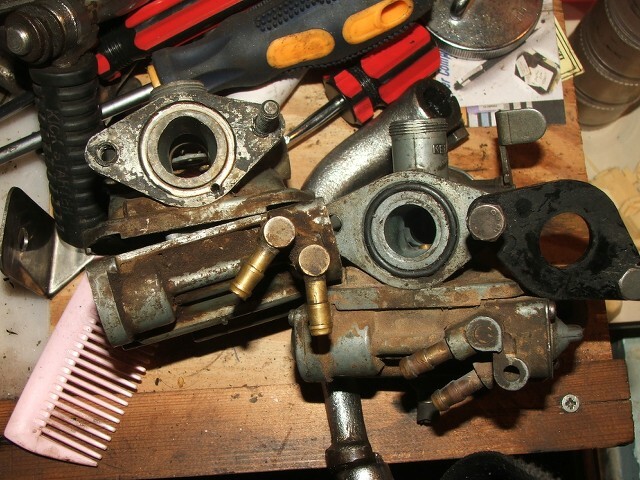 Most of the stock ST/ATC70 manifolds are small bore,may be best to look out for one from a DX90 or a skyteam 110 Dax as they should be bigger bore and should have a 18/19/20mm carb as stock.One carb to look out for is the 6v C90 or early 6v ATC90 carb as these are about 19mm and look like the stock ST one but bigger bore. This is the ATC90 and ST70 carbs to show bore size.